When I came to Emory, I vowed to take advantage of Atlanta’s thriving cultural scene. I was going to go to comedy clubs, meet people from all walks of life and, most importantly, I was going to try exotic cuisine. Little did I know how quickly I would become trapped in the Emory bubble — a life of endless homework and extracurricular stress. When January rolled around, I left my textbooks behind and renewed my vow to this city. My first stop was the newly opened Taco Cantina in Old Fourth Ward. Unsure what to order off the slightly overwhelming menu, my friend and I asked our waitress for her suggestions. She quickly recommended the Torta Cubana, bragging that it was included in Atlanta Magazine’s list of “20 Great Sandwiches in Atlanta.” Still, the availability of 14 tacos, not to mention the tostadas and burritos, did not make our decision easier. I also couldn’t help but notice the influence of the chef’s seafood roots on the menu, which offers five different fish tacos. My friend was sold on the Torta Cubana, but I decided to stick to the taco menu, getting the Veggie Taco and the Confit Portabella Califlower Taco. My friend also added the La Tinga de Pollo (Chicken Tinga) Taco to his order in an effort to diversify his plate. Since the restaurant called itself fast-casual, I was put off by the wait time, about 30 minutes, for our relatively small order. As we waited we took a look at the beer menu which touted several Atlanta microbrews including Second Self Junipa, Red Brick Hoplanta, Treehorn El Treeablo Cider and, of course, everybody’s favorite Sweetwater IPA. When our food arrived, we took a few minutes to snap some pictures (because if you don’t have pictures, did you even go?) and then dug in. I was pleasantly surprised by the volume of my first taco — the veggie, which held just enough of each ingredient to fill my mouth with a combination of fresh lettuce, savory salsa verde, crunchy cucumbers and warm rice. I loved the feel of the corn tortilla in my hand and lavished each second as I angled the dense filling into my mouth so the taco’s juices would drip onto my tongue. Although the taco was pretty traditional — rice, beans, lettuce, cucumber, corn, pico de gallo and salsa verde — the freshness of each ingredient was remarkable. Its thesis was clear: Simple doesn’t necessarily mean outdated. I admit I was more excited to try my second taco, the Confit Portabella Califlower, which looked slightly more experimental on the menu. Filled with cutlets of portabella mushroom and roasted cauliflower, some arugula and largely underwhelming red onions, I was pretty disappointed in the second half of my meal. The mushroom and cauliflower, which held the bulk of space in the taco, were tasteless, and, had I not doused the whole taco in salsa verde, I’d likely have left the taco unfinished. My friend could not stop raving about his Torta Cubana from the moment they put it in front of him. The pork was juicy. The flavors were sharp. The smell was intoxicating. And while the tacos were hearty, they had nothing on this mammoth sandwich, which my friend couldn’t even finish, leaving one bite on his plate. As for the Chicken Tinga, my friend assumed he would get a typical version of the dish, with very little chicken that was most likely dry and too many veggies shoved on top to overcompensate. But to his surprise, the opposite was true. The meat was juicy (he likened it to barbecue), and the onions and tomatoes enhanced the chipotle adobo and queso fresco. His only qualm was the side of rice and beans served with his sandwich, which he called pretty standard and boring. 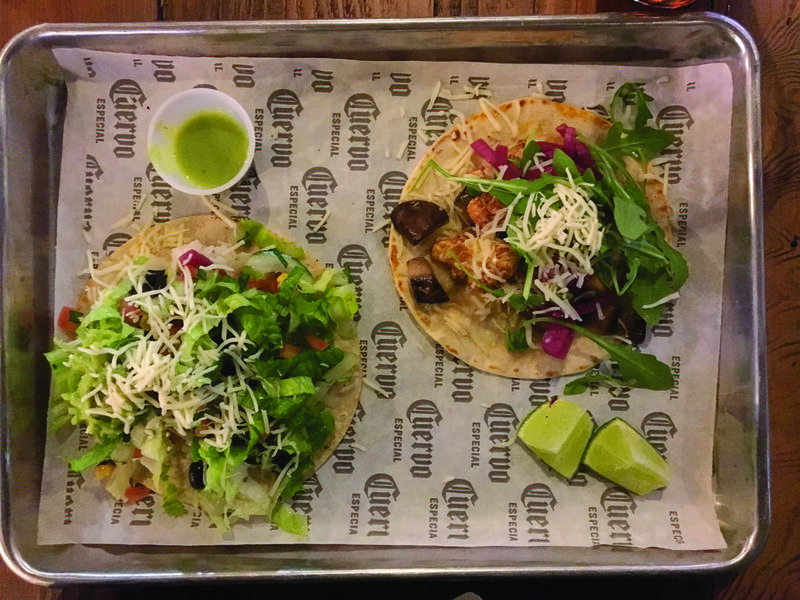 With most tacos hovering around $4, Taco Cantina won’t sting your wallet too much, and while the spot is more of a family restaurant than a hip hangout for 20-somethings, the food is solid and the ambience is calming. Don’t expect too much, and you’ll be pleasantly surprised.